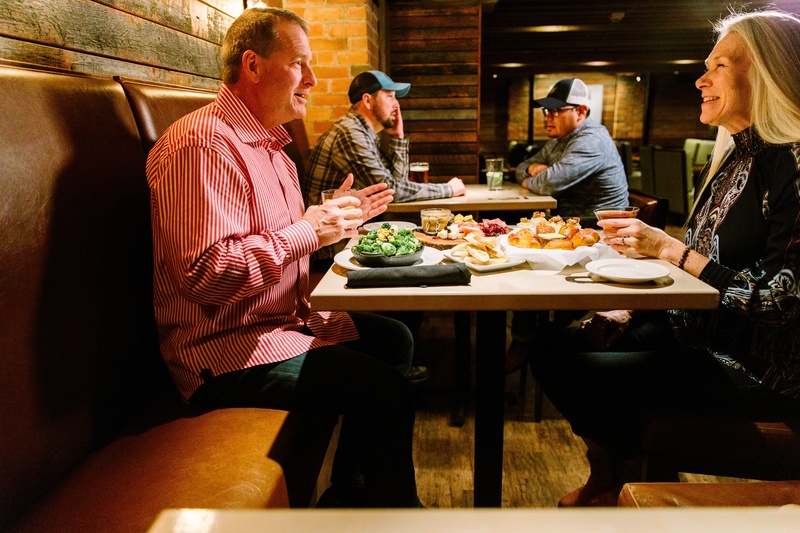 The restaurant scene in Bozeman is vast and varied. We’re pretty darn lucky to be tucked up in the mountains with food that rivals city fare. 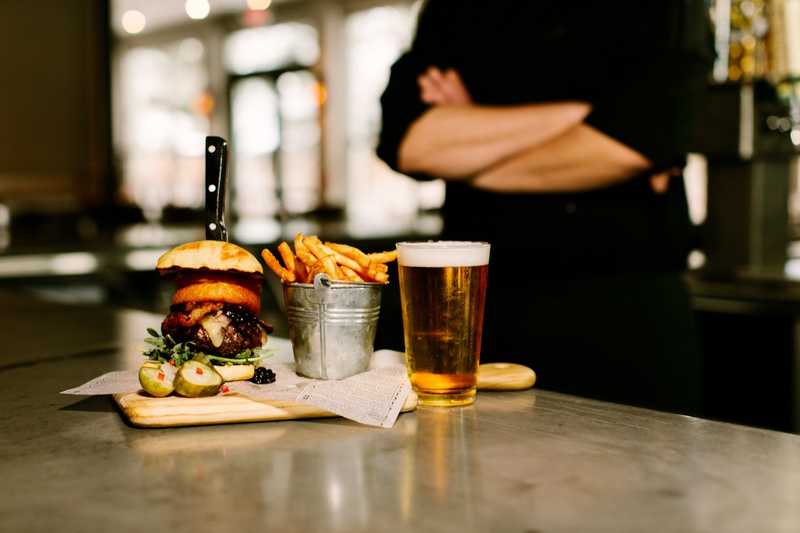 After a day adventuring, studying or simply a long day at work, there’s nothing like relaxing with a cold beer (or other libation) and some good ole pub food at one of the many amazing Bozeman restaurants. Across town, chefs are taking this traditional style of menu and turn it into something spectacular. Read on to tantalize your tastebuds! Cheers! At Bozeman’s only gastropub, (n. a pub that specializes in serving high-quality food) you’ll love the atmosphere as much as the food. Dark wood, warm light and high top tables bring an elegant coziness to the room; your quintessential pub. What you won’t find, is anything ordinary. For small plates, try the Duck Poutine with duck confit, crispy french fries and duck gravy. If you’re not a bacon lover, the Drunken Pig might just make you into one. Tempura fried bacon (yes, it’s deep fried bacon) is served with a scotch ale gorgonzola dipping sauce. Or try the Cajun Frog Legs; buttermilk fried frog legs, with sweet cream corn grits, lamb andouille sausage and a bell pepper tomato sauce. For the traditionalist, the Huck Burger made with grilled, local, grass-fed beef is topped with a huckleberry glaze, cheddar cheese, bacon and crispy onion straws on a potato bun. Conveniently located in the center of town, Midtown Tavern has a bright, comfortable atmosphere complete with a new game room and a summer patio. The menu hosts a bit of a southern flair, with dishes like the Chicken and Waffles; crispy chicken strips and bacon served over a signature waffle with maple syrup and pecan butter. Seafood lovers can choose from fish and chips, peel and eat shrimp, a bucket of steamer clams or fried oysters. For a real treat, try the traditional crab boil with Alaskan crab legs, clams, shrimp, kielbasa, corn, and potatoes all boiled up in an old bay tomato broth. If you need something on the lighter side, the wedge, chopped or raspberry kale salads are sure to satisfy. A Bozeman icon, the Rockin’ R, as it’s fondly called, is a local favorite. After its opening in 1947, it quickly became the working man’s bar. As the years went on, it grew to be a favorite of the local college crowd, particularly on game days. The tradition carries on today with some modern enhancements, (such as 20 big screen TV’s, 4 billiard tables and dart boards.) Sports aside, this pub food rocks. The pulled pork nachos are piled high with real chili con queso, and are big enough for a whole table to share. Lamb kebabs are accompanied by grilled spring onion and mint dijon. The BLT is made with fried green tomatoes and chipotle mayo. Traditionalists will love the classic pastrami on rye with sautéed onion and swiss cheese. Yes, the name says "Whiskey Bar" but this classy restaurant knows how to pair it with some serious pub snacks. While full dinner service is available, many people love to gather for happy hour food and drink specials in the comfortable bar area. Popular noshes include soft pretzel bites with jalapeño beer cheese dip, fried pickles, bison sliders and cheese curd mac. While you may find pickled eggs in some pubs, you most likely won’t find deviled eggs, especially stuffed with blue crab, chives, old bay seasoning, avocado and shaved radish. The newest brewery and pub, Mountains Walking, is gaining popularity not only for it’s delicious beer (we recommend the Junegrass IPA or the rotating sour,) but for their unique food. A favorite of kids and adults are the crispy brussel sprouts and it's a great way to get your greens! Sandwich lovers should try the Bahn Mi Sandwich made with Mountains Walking beer, glazed pork belly, pickled carrots, jalapeños, cilantro and chicken pate served on french bread. The bison chili is a belly warming treat and topped with cheddar cheese, bacon, jalapeño, sour cream and green onion. Served with corn bread, this is comfort food at it’s finest! Hungry yet? For more Bozeman restaurants, go to Bozemancvb.com.